This picture is not my recipe, but I am traveling and don’t have a picture of this dish on hand. This one looks close to mine though. This recipe is the result of trying to make something vegetarian and vegan for various members of my family over the years around Thanksgiving. I wanted something complex and that takes time, not as much as a turkey does, but still, not simple, something special so they feel included in the festivity. This recipe is the result of that and I have made it vegan many times for when I have vegan guests. It does take some time and has lots of ingredients, so don’t try to do this at the last-minute. (optional) 1 cup or more of cooked quinoa, barley or wild rice can be used instead of the bread crumbs. Don’t do bread and grain, use one or the other or neither. fresh feta (sheep or goat milk preferred by Nicole) obviously don’t add this ingredient if you are making this for vegans. The first step is to bake the squashes while they are whole. I really do not like working with raw squash. You can easily cut yourself if you are not adept in the kitchen or with cutting raw squash. They are large, bumpy, hard and complicated to work with raw. If you cook them first and let them cool down a little bit they are a hundred times easier to work with. So, cook them first in the morning or something, this part is easy. Preheat the oven to 375º. Wash the outside of the squashes and while they are still wet, pour a little oil into your hands and rub around the squash. You are giving them an oil rub. Place them on a baking sheet with the stems up or on the side, do not puncture them. Cook for 20–40 minutes depending on the squash and the number of them on a baking dish. When they are pretty soft, but not all the way cooked, take them out of the oven. If you didn’t do this step hours ahead of time, then leave your oven on, but reduce heat to 350º. While the squashes were in the oven, you should have been preparing the stuffing. If you did this step hours ahead of time, then start preparing the stuffing part now. The key here is your preparation ahead of time, before you start cooking ingredients together it is best to have everything chopped up and in small bowls or piles on hand, so you can add the ingredients when you need to. In a large heavy–duty frying pan or cast iron frying pan heat the butter or the oil. When it is warm (almost brown for butter, just hot for oil) throw in your onions and sauté for 10 minutes or if you have lots of time and are doing this ahead of time, go ahead and carmelize them, which means cooking them on medium to low heat for at least 30-50 minutes with a lid and stirring frequently. It’s okay to just cook them for the shorter time, I give you permission, if you are in a hurry to just sauté them for the shorter time. Add in the celery and the mushrooms and the fresh herbs, sauté for five minutes, add the apples, nuts, dried fruit, sherry and ½ cup or so of water or vegetable stock, mix it all up cook for a minute or so, then add the bread crumbs. You may need to add more cooking sherry or water if this is sticking to the bottom of the pan. You can also add more butter or more oil. Taste often and adjust your spices. At this point your squashes will have had time to cool down. Cut the delicatas or butternuts in half lengthwise (this should be easy, now that they are cooked), remove seeds. For the other kinds that are more pumpkin or rounder shaped, cut a circle around the stem and take the top off and remove the seeds with a spoon. 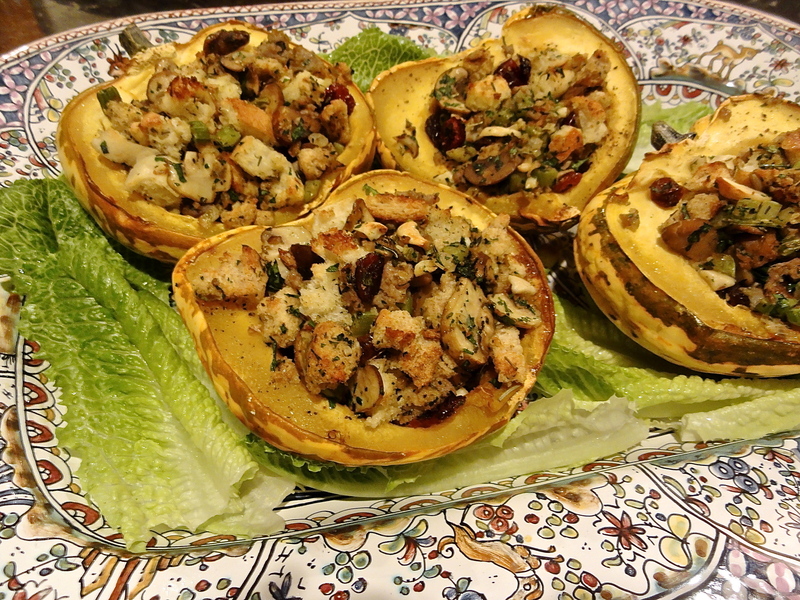 In a nice baking dish, place your squash halves or whole rounds and then ladle the stuffing into them, pack the stuff in. You can add a drop of butter or oil to the top of each for more richness or not. I also put fresh sheep or goat milk feta on top of mine, which I think makes this recipe, but my husband cannot abide goat or sheep milk feta. His squashes don’t ever get that on them and he still loves them. So, do whichever appeals to you. Put them back in the oven and cook for another 15-20 minutes or so. 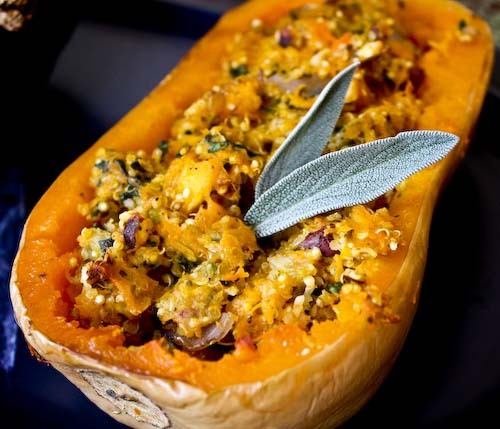 If you have left over stuffing put it in a small well oiled baking dish and bake it with the squash. I make this dish at Thanksgiving or whenever I get fresh squashes from my local CSA (Community Supported Agriculture) farm Redwood Roots. This is a great alternative to a Turkey for your vegetarians. I also recommend doing this a day before any large feast, so you can work on other dishes if you are making a variety of foods. This dish keeps well overnight and you can just warm these up in the oven before serving them. Another variation that looks close to how mine do.